White Heat (1949) is one of the 1001 classic movies you should see. It stars Margaret Wycherly (middle) and James Cagney as a devoted mother and son who also happen to ruthless gangsters. Virginia Mayo (left) plays Cagney's unhappy wife. Due to an unexpected illness, I didn't write about The Manchurian Candidate for last week's edition of 1001 Classic Movies. I will complete and publish that review in September. Each week, I'm going to recommend a classic movie you should see (for the reasons behind the 1001 series and reviews of earlier films covered go here). Every August TCM airs its Summer Under the Stars film festival, which features 24 hours of movies from a different old Hollywood actor for 31 days. This month, I'll be covering one movie from each Saturday's honoree; Aug. 26 is James Cagney day, so I'm writing about the film noir, White Heat (1949). Another Cagney movie covered in this series is Yankee Doodle Dandy (1942), which is airing at 2 p.m.
White Heat tells the story of Cody Jarrett a ruthless gangster who runs a criminal syndicate with his equally ruthless "Ma" (Margaret Wycherly). After a botched railway robbery, Cody, with Ma and his wife (Virginia Mayo) in tow, holes up in a dingy motor court where he shoots and wounds a federal officer (John Archer) during a stakeout. Rather than do serious time for injuring a "copper," Cody pleads guilty to a lesser charge and ends up in the Illinois State Penitentary, where an undercover officer (Edmond O'Brien) is assigned to get the goods on Cody and Ma's gang. 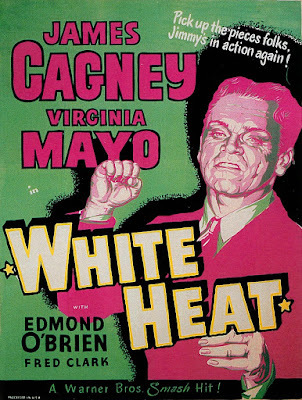 White Heat, which is based on an original story by Virginia Kellogg, was Cagney's comeback vehicle at Warner Bros. He abruptly left the studio in 1942 over a dispute about what kind of parts he should be offered: Cagney wanted more roles like his Academy Award-winning performance in Yankee Doodle Dandy, while Warner's wanted more tough-guy movies. By 1949, Cagney was in need of cash so he agreed to work with his old friend, director Raoul Walsh, on one more gangster film. The result was a critical and box-office hit that is still one of Cagney's best remembered bad-guy roles. Although Cagney would continue to make movies for 12 more years, in some ways, White Heat is his valedictory performance. Cagney first burst on the scene in 1931 as doomed bootlegger Tom Powers in The Public Enemy and his thirties career was filled with memorable performances as angst-ridden hoods in films like Angels with Dirty Faces (1938) and The Roaring Twenties (1939). Cody is very much of the same mold as those early characters -- he hates the police, but can't resist a pretty girl -- but with some key differences. Cody's frequent headaches, nervous tics, and mother fixation make him a criminal whose Freudian neuroses were very much in tune with America's Postwar anxieties. 1. Cagney. 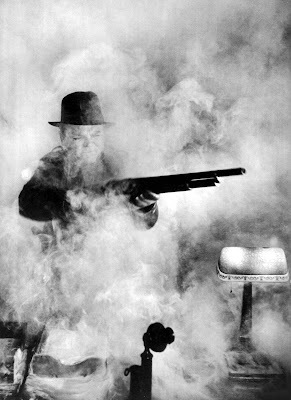 White Heat provides Cagney with two of the most-storied set pieces of his legendary career. First is the famous prison cafeteria scene (clip here, watch for a cameo from the great athlete Jim Thorpe in this scene) and second is the fiery grand finale in which the actor goes out in an unforgettable inferno (clip here). 2. Cody and Ma. Kellogg based her original story on the infamous Ma Barker and her criminal gang of four sons. However, once Cagney came on board, the script was changed to focus on Cody's all-encompassing relationship with his smothering mother. She's the only one who can soothe his severe migraine headaches by feeding him fresh strawberries, but she's also every bit as devious and ruthless as Cody. Her maternal hold over Cody even transcends death as the horrified police soon come to find out. 3. Virginia Mayo. A favorite among noir fans, Mayo has one of her best femme fatale roles as Cody's scheming wife, Verna. One minute she's needling Cody for a new mink coat, while the next she is plotting with Cody's disloyal partner (Steve Cochran) to take over the gang. 4. Police techniques. The scenes in White Heat that show police surveillance of Cody and his gang are meant to showcase the latest methods in law enforcement. Most of this technology seem laughably out of date in 2017, but, at one point, they do use an early version of a GPS system (there's more here). James Cagney as Cody Jarrett in White Heat (1949). Other critics: White Heat has a 90 percent fresh rating on Rotten Tomatoes and Leonard Maltin writes that Cagney is "older, but forceful as ever" and that the "'Top of the World' finale is now movie legend" in a 3.5 star review for his Classic Movie Guide. Critics in 1949 mostly turned in rave reviews. Even The New York Times usually unflappable Bosley Crowther penned a rave, writing that White Heat was "the acme of the gangster-prison film." Crowther compared White Heat to Cagney's breakthrough role in The Public Enemy. "Mr. Cagney achieves the fascination of a brilliant bull-fighter at work, deftly engaged in the business of doing violence with economy and grace. His movements are supple and electric, his words are as swift and sharp as swords and his whole manner carries the conviction of confidence, courage and power." The Bottom Line: There's no doubt that White Heat is a Cagney tour de force, but there are also great performances from Wycherly, Mayo, and O'Brien, and crisp, documentary-style direction from Walsh. Availability: White Heat will air at 8 p.m. Aug. 26 on TCM. Also available on DVD, Blu-ray, and video on demand. I'll be off next week for Labor Day, but the 1001 series will return in two weeks with a review of The Manchurian Candidate (1962).